Beijing, or the northern capital as it has been termed, has been on the historic map for about a half million years when Peking Man once lived in the caves of what is today suburban Beijing. The following text offers a plethora of facts and trivia about one of China’s greatest cities to date. Some of the earliest settlements near present-day Beijing were named Ji and Yan. The State of Yan named Beijing its capital during the Warring States period of 475 to 221 BC. These early incarnations of the city served as trading posts for northern peoples like Mongols and Koreans. Because Beijing’s location is near China’s historic frontier, it has witnessed a terrific amount of turmoil between China and its neighbors. Under Genghis Khan the city was besieged for seven years until it finally fell to the Mongols in 1215 AD. 1406 through 1420 saw the building of Beijing’s Forbidden City, home of Ming Dynasty emperors. Twenty-four emperors ruled from this eminent locale. Visitors are welcome to visit the Forbidden City which is located at the rear of Tiananmen Square. This complex holds nearly one thousand rooms. 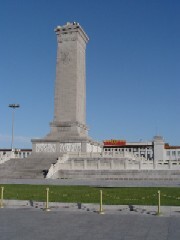 Tianamen Square is also the resting place for Chairman Mao’s tomb. Beijing was only reinstalled as China’s capital as late as 1421 AD. Beijing enjoys four distinct seasons. Most travelers prefer to visit the city in summer and fall. Beijing’s official flowers are the chrysanthemum and the Chinese rose. Beijing is the current capital of the People’s Republic of China. Currently there are more than fifteen million people residing in Beijing. Most residents are of Han ethnicity. China’s largest wooden Buddha statue is located in Beijing’s Yonghe Lamasery. The city is considered to the bicycle capital of the world as has many parking lots dedicated to bikes alone. The Beijing Zoo is often a major tourist destination that is perhaps most notable for its panda bears. It is also the largest zoo in the country. Behai Park is also a place of interest for both residents and visiting travelers. Located near the center of town, the park is famous for its boating lake. Beijing’s main street is actually called Wangfujing Street and contains a plethora of shops and food stalls. Some of Beijing’s most noteworthy museums include the Museum of Chinese History and Zhoukoudian Peking Man Museum. Beijing is slated to host the 2008 Summer Olympics in 2008.